Apple season is here! 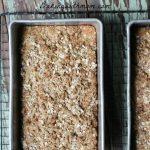 This Apple Cinnamon Bread With Crumb Topping is soft, full of flavor and delicious for breakfast, snack or to pack in a lunch box. It is entirely possible the fall recipes will be overabundant here on Baking With Mom. I am a huge fan of fall and fall flavors so this time of year, the oven gets fired up and my house smells like cinnamon. A lot of cinnamon. 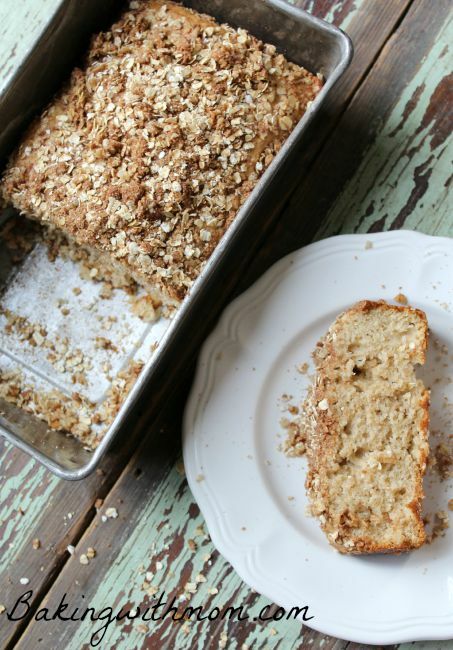 Cinnamon like in this Apple Cinnamon Bread with Crumb Topping. I love all the soft apples baked in a pie or bread, the smell of cinnamon and the pumpkin and leaf decorations. The oven is on and we start to think about starting a fire in the fireplace. Of course, we sit by the fire with a cup of hot cocoa or apple cider. Or a latte. A delicious latte. The air is chilly and everyone enjoys the thought of cooler weather. Of course, we all push from our mind the upcoming freezing temperatures, 3 feet of snow and 4 layers of winter clothing. Let’s just focus on the slight chill in the air, shall we? My husband and I were scrambling today to get all of the outdoor projects done. We have grass seed that needs to start growing before all of the leaves start falling. When I say leaves, I mean leaves. There isn’t just a tree or two in our yard, oh no. We don’t really want to be raking all of the leaves off of newly planted grass, so we are kind of in rush mode. As the afternoon wound down and all of the projects got completed, I knew I wanted to bake something with the apples my sister gave me. I don’t want them to go to waste as they are great baking apples. There are different apples to use for baking and canning. This chart helps sort it all out for you. I also thought I could put more bread in the freezer for the kids’ lunches. It makes mornings so much less stressful when we have a food already made, prepared and ready to throw into a lunch bag. So obviously, apple bread was the recipe of the day. As usual, I didn’t measure the amount of cinnamon I added to the recipe, but I will do my best to estimate it for you. As I say, why measure cinnamon. Can you really add too much? I think not. You will combine the dry ingredients in a separate bowl. I typically like to use as few bowls as possible because the less dishes the better, right? But sometimes, it is best to stir the ingredients separately before mixing them together. 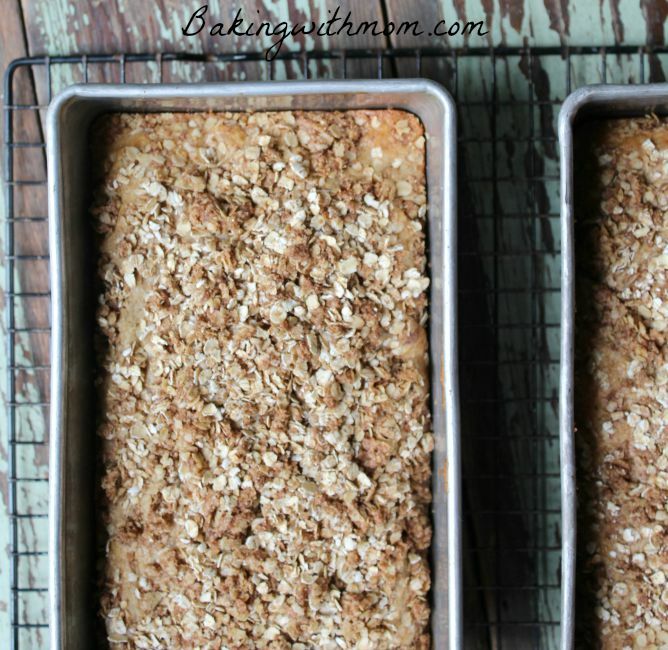 This fall flavor bread, Apple Cinnamon Bread with Crumb Topping is a moist and delicious bread. Full of flavor with chunks of apples and sprinkled with cinnamon.